Depression is a word used a lot these days, and it's great that people feel that they can come out and talk about their problems, but what isn't great is the £266.6 million the NHS spent on anti-depressants in 2016. It's shocking I know, but with very few other proven ways to treat mental illnesses it means that we're spending more on suppressing the symptoms and less getting to the root cause of the problem. But hey, what about exercise as a possible part of a solution? Depressive disorders are mainly characterised by a depletion of glutamate and GABA, these are two neurotransmitters in the brain, however when the levels of these neurotransmitters return to normal it shows signs of health being restored. A study found a correlation between the resting levels of glutamate and the amount of exercise people were doing, therefore this could suggest that by exercising, you are raising the levels of glutamate in the body and helping to fight depression. Exercise activates metabolic pathways that replenish these neurotransmitters, in fact, vigorous exercise is the best thing you can do for the brain metabolically, it works harder than when you're playing chess or solving a puzzle. But it's not just about the science it's also about how exercise makes us feel. We've all had that feeling of pure relief but also happiness after a tough exercise session. Sure during it you wanted to face plant the floor, but there is no better feeling than knowing you've achieved something, whether it be beating your personal best or just getting to the gym 3 times a week. The University of Michigan created a study of 295 patients who were receiving a treatment at a mental health clinic and 85% wanted to do more exercise, with 80% saying that exercise improved their mood. But it doesn't have to be intense and vigorous exercise, several studies have found that exercising outdoors is associated with better wellbeing, increased energy and decreases tension, confusion, anger and depression. But what can be done about this? If you're in a low state of mind it can be very difficult to force yourself to take part in physical exercise, and this is exactly why baby steps are needed. For example, walking 10 minutes extra a day, or stretching for 10 minutes every morning and evening, if you want to throw yourself into it then that's great but if not it's better to take things nice and slow. And where could the health care system potentially improve? Referring patients to specialist Personal Trainers that will help them to overcome their mental and physical barriers. Of course a psychiatrist can help, but what if they were able to send clients to fitness professional and put this science into practice? It may not be the answer to fighting depression but it sure isn't a bad place to start. Every morning I do 10-20 minutes of yoga as soon as I wake up. I will admit, sometimes it's difficult to get myself out of bed, i'm only human, but you cannot beat a good stretch in the morning. Think about animals, the first thing they do when they wake is stretch so we should be too, releasing all of the tension from staying in a static position overnight. Yoga is also beneficial for your mind, instead of waking up and thinking about all of the things you have to do in the day, you can wake up and focus on your body and slowly prepare yourself for the day. Meditation is similar to Yoga in the sense that it's a moment to focus on the present moment and not think about what has or is going to happen. Meditation is not easy, and i'm no master of it, some days you can sit there and let the time pass without much worry or emotion, but other days you get worked up because you can't seem to just relax. But that's okay. The fact that you're doing it is what matters and any time you have to just sit and be in the moment will benefit you, even if it's just 2 minutes. Breakfast is my favourite meal of the day because there are no limits to what you can eat. I know a lot of people skip breakfast or just grab a slice of toast on the go because they like to spend as much time as possible in bed. However, waking up and heading straight into the madness of the day isn't good for your head. 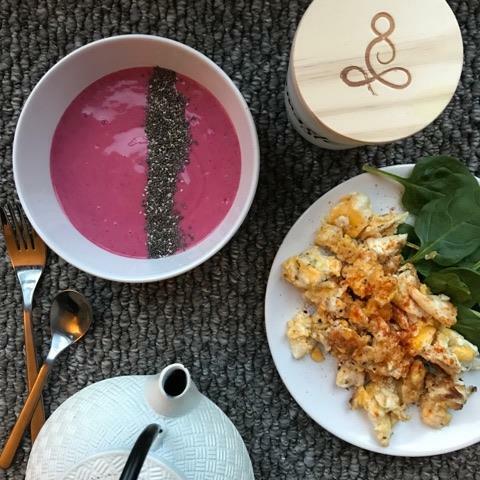 Filling your body with a high protein breakfast will leave you feeling fuller until lunch time and stop mid morning snacks. Plus, taking 10 to sit and eat will also allow you to take a break before the day ahead. I like to take things slowly in the mornings because if you rush you forget things and then that messes up the rest of your day. If you have children I understand that it's difficult not to rush on the school run. But what about getting things ready the night before? Or, wake up 15 minutes before everyone else and set that time aside for yourself and not getting the children ready. Who tries a new detox every January? Exactly. If you're having to do a new one each year it obviously isn't working is it. If you want to make a real change that's lasting but you don't know where to start, do your research. Find a good Personal Trainer, a good Nutritionist or maybe even a Doctor/Nurse and ask them for some help. Websites such as the NHS offer lots of basic advice to give you underlying knowledge of where to start. 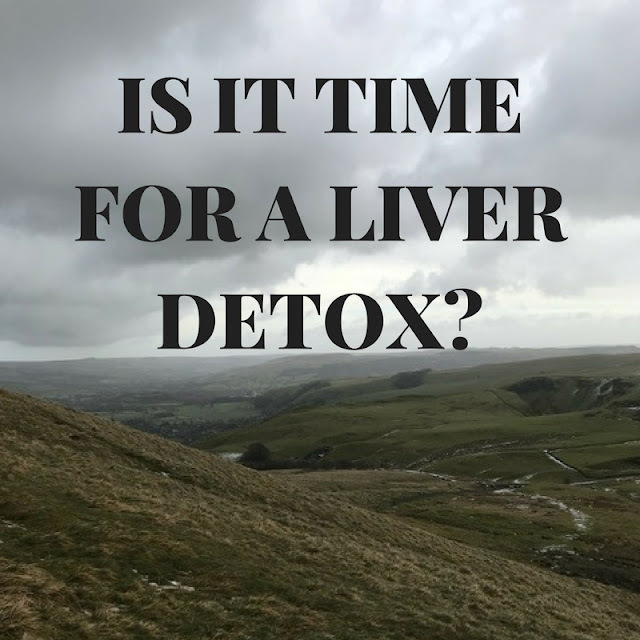 Most of us don't have the money for an overpriced 'detox' at the best of times but especially not in January. A lot of people complain that eating well is expensive but it's a lot more bloody expensive to buy a short lived diet plan that will have little effect on your future diet. Instead of spending that £50 on a crappy detox, spend it on REAL foods, meaning locally sourced, fresh meat, fish and vegetables, that's the only detox you need. Chances are if you lose weight quickly, too quickly that you will eventually put the weight back on. I'm really not trying to be sinister but it takes around 66 days to change a habit and if you've just lost a load of weight in 2 weeks you may feel great but your mindset won't have necessarily changed and your relationship with food may not yet be healthy as you go back to binging. Plus, if you're on a 3 day juice cleanse and you lose 6 pounds in these days then you've mainly lost water weight i'm afraid. If you've not learnt how to eat well and gone straight back to your usual diet that juice cleanse has done nothing for you. I'm sorry to break it to you but if you didn't already know this i'm telling you now, there's no magic pill, and if there was it would cost millions because pharmaceutical companies could make so much money from it. The only way to lose weight/ build muscle is to eat a healthy and balanced diet and exercise a sufficient amount. This way you'll be nourishing your body with the right nutrients whilst also burning fat and building muscle, a mix of cardio and resistance training is the best way to build your overall fitness. Is it time for a liver detox? And no I don't mean spending a silly amount of money on a 5 day juice diet that will cleanse your soul, something much easier and cheaper, cutting down your alcohol intake. We're back at the start of the year again, the festive period is over and the scales have risen after consuming ridiculous amounts of food and drink, but it's okay because it's Christmas. As a Personal Trainer I obviously promote a healthy lifestyle but even I let it slide a bit this time round because I felt I deserved the break after a year of hard work, (but that's not how i'm feeling now after looking at the scales). 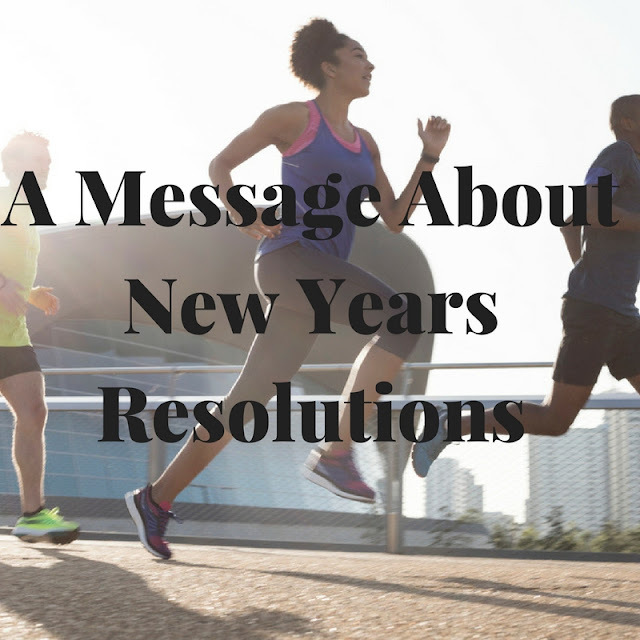 However, for many it's time to cut down the alcohol intake and whether you're looking to lose some weight or just be healthier it's important that you put the glass down. As well as having obvious negative effects on the body such as the ones above, drinking too much can also lead to weight gain. 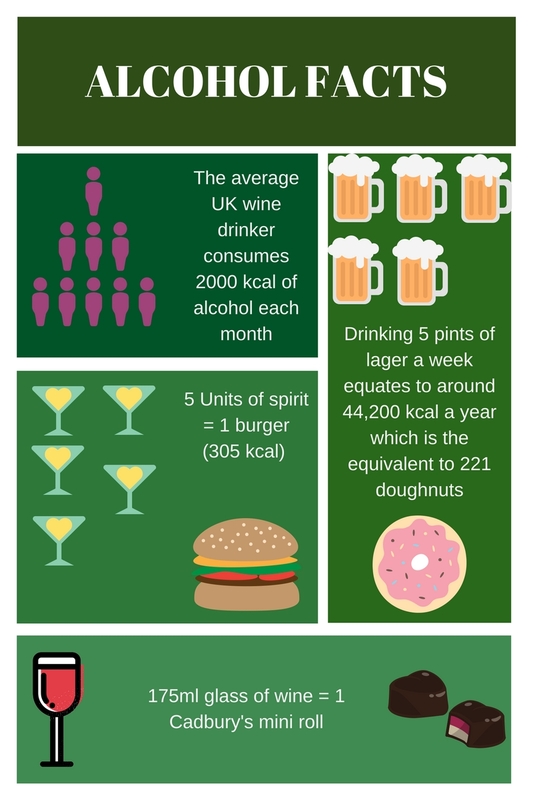 1g of alcohol is the equivalent to 7 calories, that's close to fat which is 9 calories per gram. This worst thing is, it's just empty calories, alcohol is made up of sugar and starch, they don't have health benefits or leave you feeling full, you're best off eating instead. There's no better time to cut down than now, and you don't have to do it alone, get a group of mates together or your partner and help each other out. Instead of going on nights out every weekend drinking yourself into oblivion, go to the cinema, or go for a meal and stick to one glass of wine. There are so many different social situations you can put yourself in that keep alcohol away or to a minimum, it just takes a little imagination. If you're doing your weekly shop and you add a couple bottles of wine stop right there and put them back on the shelf. It's the same idea as having bad food, if it's in your cupboard you're much more likely to have it. Therefore if you have to make the conscious effort to go out separately to get it you'll be much less inclined. Plus it could save you some pennies. Smaller is better. Tried eating smaller portions of food? Why not try a small glass of wine or get half a pint in the pub instead of a full pint? If you actually enjoy the taste of the drink slow yourself down and take the time to appreciate the drink instead of glugging it down to get the next one straight in. If you're looking for more facts about alcohol or are looking for more advice, use the links below, all reliable government sources!